OK, so this is not a movie about the 1992 United States men’s Olympic basketball team. That would be Space Jam, maybe? I think most of the players were in that movie. Anyway, this is a movie about four mental hospital patients who end up running around New York City unsupervised when their doctor gets knocked unconscious after witnessing a murder. My hopes weren’t super high for this movie based solely on the fact that I’ve never heard of it. But then, it does star Michael Keaton, Peter Boyle, and Christopher Lloyd, so maybe I was wrong. The truth is somewhere in the middle. The Dream Team is just ok. All the funniest parts happen in the first twenty or so minutes, and from there things get boring. There’s some nice character development as the men visit their old lives before entering the mental hospital and start to heal. It was also nice that no one was magically cured thanks to this field trip. They all return to the hospital in the end, a little better but with a lot further to go. I expected more from The Dream Team. A movie starring Beetlejuice, Doc Brown and Raymond’s dad should be comedic gold. Sadly it isn’t, this is an average film that left me very disappointed because it is a very interesting premise that is poorly executed by a usually solid cast. The film is set in a mental asylum in New Jersey. Michael Keaton, Christopher Lloyd, Peter Boyle and Stephen Furst star as a group of inmates. Their doctor (Dennis Boutsikaris) wants to take them on a field trip to Yankee Stadium to reward the progress they’ve been making recently. On the way to the stadium, their doctor is knocked unconscious after he witnesses a murder, leaving the mental patients to their own devices in New York City. When they are thought to be responsible for their doctor’s attack, they go on the run. The group soon realise that they need to stick together if they hope to solve who really attacked their doctor and clear their names. This film had so much potential. 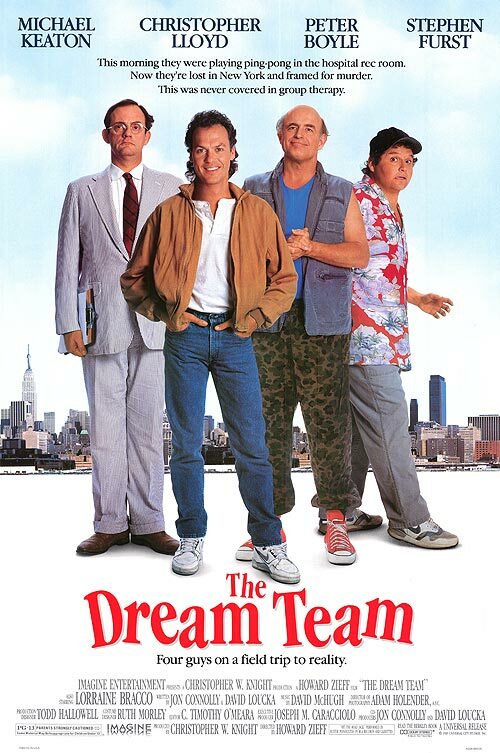 Watching a group of mental patients, led by Michael Keaton, explore New York City should have been hilarious. I rarely laughed in this film. The best moments are early on during the foursome’s group therapy session and after that, this film deteriorates into more of a drama than a comedy. When you have the comedic talent on hand, it seems silly to waste their skills being dramatic. Lloyd and Keaton are ok. Christopher Lloyd is very funny early on when he acts like a doctor’s assistant rather than just another mental patient. Michael Keaton has his moments too. He plays a compulsive liar with anger issues. Some of his scenes with Christopher Lloyd are very funny, but they really only tease what might have been with this film. I really wanted to like The Dream Team. I enjoy this whole cast usually, but here, they are let down by a script that does not use the great cast to its full potential. It can’t seem to decide if it wants to be a comedy or a drama, because of this, it ends up being neither.